75 days. Solanum lycopersicum. Open Pollinated. 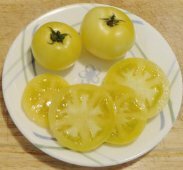 Plant produces good yields of 4 to 6 oz pale yellow-white beefsteak tomatoes. 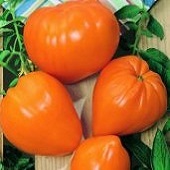 They are very flavorful with mild fruity sweetness and a slightly tart flavor. 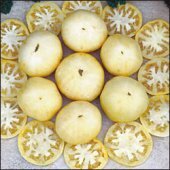 Perfect for salads and slicing, for making a white tomato sauce and culinary creations. A potato leaf variety. Excellent choice for home gardens. Indeterminate.